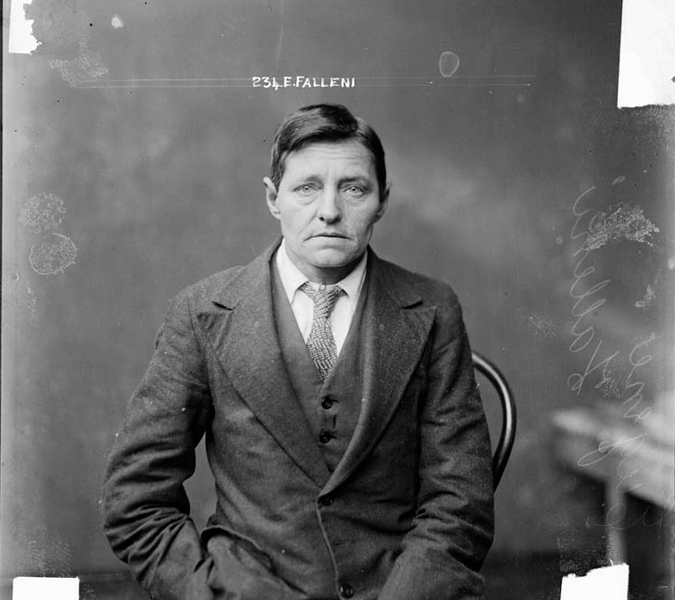 When ‘Harry Leon Crawford,’ hotel cleaner of Stanmore was arrested and charged with his wife’s murder he was revealed to be in fact Eugeni Falleni, a woman and mother, who had been passing as a man since 1899. In 1914, as ‘Harry Crawford’, Falleni had married a widow, Annie Birkett. Three years later, shortly after she announced to a relative that she had found out ‘something amazing about Harry’, Birkett disappeared. There’s a bend in his nose on a worker’s face, pallid, wide, the eyes sad, longing. But he is posed, sitting on a simple chair, his right hand buried in his pants pocket, the other dropped loosely in front between his legs; your eyes move up and see a suit jacket, buttoned, over a vest, buttoned, the dress shirt, the tie, barely loosened, around his neck, her neck, the tie that can be pulled tightly to snug out her breath and she imagines it cinching further to close the loop, to pop her body off like a dandelion stem, leaving just her head. Her head is most valuable because that’s where she knows doubtlessly that she is indeed “he”—her head is the unarguable forum, her head holds the truth where nothing is minced. It is where the future is kept and it floats there, separate from the body, the neck tie dangling, and like a child’s balloon she imagines being released from an empty, little hand and swept up, elsewhere, away, while rising, above. He was no longer she, in many ways. And while it is, yes, most important for one to be oneself in one’s own consciousness, the change to he comes with the ancillary desires to have “he-ness” in the world, to mesh somewhere, to be interdigitated, to be part of a collective and to move forward within it. To live.